Friends received two contracts in 2005 and a third in 2008 from the San Francisco Bay Salmonid Habitat Restoration Fund to improve fish habitat in Corte Madera Creek and its tributaries. We used that funding to assess barriers to steelhead passage in our watershed and to develop designs to address three different problems that steelhead encounter when they are migrating and when they seek out deep, cool pools necessary for their survival during the summer and early fall. 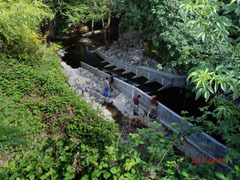 These problems are: inadequate resting pools in the concrete channel in Kentfield and Ross; a poorly designed fish ladder and unstable streambanks immediately upstream of the concrete channel; and other barriers caused by identified culverts and low dams that keep fish from moving easily between spawning and summer rearing habitat. We also did the design and began permitting for replacing old fish ladders at Saunders Avenue in San Anselmo and at Pastori Avenue in Fairfax, and for installing a new fishway on San Anselmo Creek at Lansdale Station. Although some steelhead were able to get past these barriers, they did not meets standards for fish passage used by NOAA Fisheries and California Department of Fish and Wildlife. For all projects, Friends assembled a team of experts, including Stetson Engineers Inc., Michael Love Associates, Ross Taylor and Associates, and Garcia and Associates, Inc. The designs for the Saunders project would remove the barrier to fish passage and accommodate flood flows, but this project would require relocating a sewer through private property and the owner will not grant an easement to bore under a corner of his front garden. For Pastori Avenue, two alternative conceptual designs were developed, but the owner of the bridge was not willing for any work to be done on his property. The permits for these projects were not issued and the biological studies are now too old to use without more fieldwork to update the information. By late 2010, the designs for the Lansdale Station project had been completed and the permits issued. 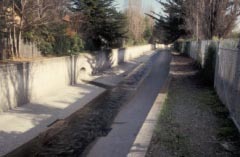 The project includes a series of baffles inside the long culvert under the intersection of San Anselmo Avenue, Forest Avenue, and Lansdale Avenue; a pool-and-drop structure downstream of the culvert; and removal of a large infestation of invasive giant reed (Arundo donax) just upstream of the culvert. On behalf of the Town of San Anselmo, we applied to California Department of Fish and Wildlife’s Fisheries Restoration Grant Program and received funding to construct the Lansdale project. Construction took place in summer 2012. The baffles and the fishway meet the goals to create good conditions for fish passage. We continue working on the planting installed after construction where the invasives were removed and the soil was disturbed during construction.